If that is really true, then how should retailers – and the downtown organizations that serve them – respond? kids room. What a great amenity! In my experience, retailers and downtowns that are doing well are not just managing the sale of products, they are also curating an experience with the product. Consider retailers offer classes on how to use the product (i.e. 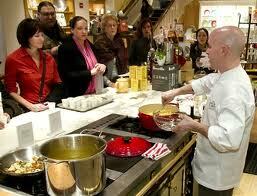 Williams Sonoma cooking classes, or wine tasting at the wine store, or jewelry making classes at Michael’s crafts). Downtown organizations might consider encouraging retailers to create these kinds of offerings, and then include these on a downtown events calendar that gets distributed widely throughout the community. I am also intrigued by businesses that really know their customer and offer complimentary amenities – like the Beanrunner Coffee House in downtown Peekskill, NY. 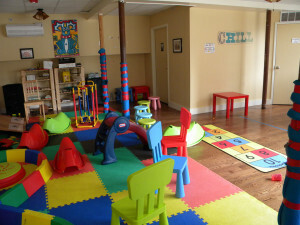 Upon entry, I was delighted to discover a small play space for kids. Too bad I live nearly an hour away, or I would be there every weekend with my 3-year old son! Another implication for the commercial district manager is the need to improve the overall experience of visiting downtown. If you manage a downtown with a great restaurant row, work hard to make the window browsing – even if stores are closed – interesting and inviting. Encourage retailers to improve their window displays and keep them lit in the evening. The experience of walking hand in hand during an after-dinner stroll down a lovely street can be the sweetest part of the evening – the memory of which causes people to return again and again. Simply put, make your district not just about what you buy, but what you experience.